SOLD AT AUCTION FOR $70,000 ABOVE APPRAISED VALUE! COURT-ORDERED ABSOLUTE REAL ESTATE AUCTION for the Estates of Betty Joyce Duncan, Deceased and Holmes Beacham Duncan, Deceased! 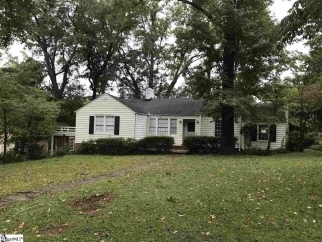 The list price is for search purposes only - this 3 bedroom, 1.5 bath home, in a prime location in Greenville's North Main area, will be sold to the highest bidder, with no reserve price, on October 3rd at 12 Noon, at a live auction (rain or shine) - the auction will be held at the home. The auction will be your ONLY opportunity to purchase this home (no pre-auction offers will be accepted) and will be an incredible chance to purchase this home in an area where homes have sold upward of $225 per square foot this year alone! Open House Dates 9/21 from 5-7 PM, 9/24 from 2-4 PM, and 1 Hour Prior to the Auction. Click the link above for the Bidder's Packet with all the details.